Another short note. Gary R. brings up the old story of Pittsburgh's #1 ranking as the most livable place in the US in 1985?? I should have realized it was in fact the 25th anniversary of that story. The theme of the article today is about how inconceivable Pittsburgh's ranking was at the time and the disbelief folks had in the publication that produced it. How big a deal was it here? A video highlighting the whole thing: Pittsburgh's No. 1. I have posted this before, but the disbelief in that result goes a lot deeper than even what Gary gets into. It really is a case study in what we call aggregation theory. The cognitive dissonance of Pittsburgh's top ranking prompted Professor of Psychology Geoff Loftus of Washington University to write an article in Psychology Today in 1985 about how screwed up the ranking system must have been. You can read it yourself: Say it ain't Pittsburgh. Basically he explained how survey based ordinal rankings of preferences really added diminishing information beyond the top picks. Pittsburgh didn't really come out on top in 1985 because it excelled in any one category, it was sort of moderately ok across the board. Thus, according to Professor Loftus, the Pittsburgh #1 ranking was really an artifact of over-interpretation of the data. Just one contrarian voice? Maybe, but it turns out that the Places Rated publisher David Savageau was so taken by Professor Loftus' critique of the system that he brought him onboard and became co-author of the almanac in 1996. Just caught this. Best use of Pittsburgh Steps in some time. Maybe stair-skiing could become an olympic event. You know... I don't think "Pittsburgh Steps" has a Wikipedia entry either. Hmm. update: I didn't see that this was mentioned in the PG today, along with a story of similar shenanigans in 1978. Anyway, it definitely goes into my list of favorite youtube videos. Tom O's piece in Trib today on abandoned mortgages got me thinking of a few things. My colleague Sabina wrote about the related and larger issue of vacant properties in the city (see page 6) and region. Plug into that whole story the recent weather and what do you get? Seriously. I was joking about the roofers... yet it wasn't a joke. Think about the damage that has been done to a lot of local property in the recent weeks because of the weather. Then consider what has been happening to all the vacant property in the region, much of which is already in serious need of repair. We have some serious concentrations of vacant and/or effectively abandoned real estate in certain neighborhoods and communities in the the region. It's one thing for damage in a home where someone makes repairs in a timely manner. What is going to happen to all the properties that have experiecned this once in a generation damage yet will have no repairs made? What is moderate damage could easily be magnified into some serious depreciation, if not irreparable damage pretty quickly. I don't have a solution for any of that... but the uniqueness of our situation in terms of the age of our homes (oldest in the nation by many metrics), the concentration of vacancy in certain areas and the magnitude of the storm all lead to a very bad outcome. and because the circumstances are so unique it is one of those things that people are not really thinking about. It's one of those unquantifyable things, but you have to wonder what the sheer value of depreciation resulting from the storm(s) has been on local property and how it compares to other events. The bottom line is that the mass of unmarketable homes currently sitting in the region may become truly unmarketable as a result of all of this. and just reading the article on vacancy reminds me of something related to the earlier article there. If you are interested I think we have created the world's most boring podcast. Click and Clack don't need to watch their six. It's Saturday; it's snowing; so what's new? Anyone remember the good old days when a good solid snowstorm meant you had to go out and whisk off a couple inches of snow from the car before you could drive off? The big question was whether you really took the time to clean off the roof as well. Why does this map again have us in the middle of yet another storm. This one to arrive barely after the current one ends. If the current one ever ends. Maybe it's all one big storm? or is that a metaphysical question? This all has given me a great appreciation for my grandfather who passed away before I was born. He had he emigrated here from the hills of Crete at age18 just about a century ago to settle in Detroit. He was drafted soon after he arrived to serve with the Michigan National Guard during World War I. What did the Michigan National Guard do during WWI? One of the more forgotten operations of the war was in Northern Russia where British and American expeditionary forces were sent to support anti-Bolshevik forces. You can see the logic that existed somewhere: The need was for troops who knew something of the cold. Michigan seemed to fit the bill for troops who would not need any special cold weather training. The American military at the time probably had little cold weather training to offer in any case. In today's military vernacular it would probably be classified as a GOBI. The whole thing would be called the Polar Bear Expedition and the 339th Infantry Regiment and associated units of the Michigan National Guard would themselves come to be known as the polar bears. The poor fellow, raised in the temperate olive fields of a Mediterranean island, was probably not well equipped to survive a winter in the environs of Archangel, located just below the Arctic Circle and one of the colder habitable places on Earth. It all must have been about as close to his vision of hell as he could have imagined. and none of it could have been in the plan when he arrived at Ellis Island. So I figure I won't complain about the snow any more. The folks at Accuweather have been running this as a headline: "Wicked Snowicane Continues to Make a Mess of Travel, Cut Power". Then the folks at the Weather Channel run a whole piece on the "extreme hyperbole" being reported. I wonder if that counts for chalkboard material among weather wonks? Which is all really just a foil to point out that there is another datapoint out there that ex-Pittsburghers run the world. One of the recently appointed top folks at the National Weather service is yet another diasporan. Gotta be a diaspora story in that somehow. Toland? Bueller? Toland? Bueller? Don't make me cover you again as with the roofers? update: check out AP wire on the semantics of meteorology of late. Earned media is earned media I figure. New York Times, the 'Antiques' section no less, has a picture and story on the mural restoration going on at the Gateway Center T station: Tile by Tile, A Mural is Saved. Just think, someone out there just looking at that picture probably thinks we have a real subway system here. And note the steps in the foreground. Aren't those the steps providing access to the trolley platform? Remember we initially used trolleys on the system even after the 'subway' stations were built; I think because PAT couldn't afford to buy new rolling stock at the time. No free lunch it turns out. Guv says Allegheny County RAD tax will decrease under his proposed budget from 1% to 0.7% in order to keep it revenue neutral for the county. Under the proposal the sales tax in Allegheny County would be 4.7%. Bring your calculator to the store with you. This is all the fungible stage anyway. I would not be overly surprised if the local 1% remains intact if this all actually happens. Agreement in Harrisburg. No joke, there is complete agreement in harrisburg (little 'h' I suppose) that Act 47 = bad. Henry George lives. Quote from UPMC spokesman in an article today about the market for space in Oakland says “nobody’s making land”. Where is Henry when you need him? Wall Street Wow. Pension has a bit more money at the end of 2009 than it did at the end of 2008. But the stock market did awfully well in 2009 as well. In that context, did the fund really even keep pace? Anyone asking about their new actuarial report that the city must have completed by now? Big Sandy speaks. Just because nobody covers the Steel industry anymore. There is a secondary story of note locally embedded in this from the WSJ this morning. First read: Steel Costs Set to Jump. The article says the price of 'inputs' to steelmaking are going to jump up in 2010. OK. For an integratred steel plant the main inputs are iron ore and coking coal. Coking coal is a big part of the economy in the environs of Pittsburgh. I must not have been paying attention of late. It says "spot prices for coking coal are hovering at $200-$250 a dry metric ton compared to the 2009 benchmark coking-coal price of about $129/ton, free on board, the person at the large steelmaker said". For a primer, I refer back to the old Slate article on coal prices. and just fyi... great new e-magazine I have added to the reading list on the right: US Infrastructure. This caught my attention. The state is taking action to plug an abandoned NatGas well venting in Moon Township. Which reminded me of something I started this some weeks ago and kind of forgot about. The theme was that there just has to be enough stuff going on for someone to have a Marcellus blog out there? I actually expect to see the Marcellus Magazine launched soon. Then I noticed someone at least has a decent news aggregator: Marcellus Drilling News web site. Worth keeping an eye on. For example, just one story there is about Atlas Energy looking for partners to develop their drilling program. It says their position is 266 thousand acres "largely in Southwestern PA". Is that correct? That's about 415 square miles. The City of Pittsburgh is 55 square miles. Can't say Marcellus is not bringing money into town... the first ever Marcellus Midstream Conference is slated to be in town in April..
Where is the snow in this picture? and I should have mentioned this already... people forget how close GM's Lordstown plant is. It's big news even for us that they are bringing back 1,200 workers there. How close is it? Google maps says it's a 75 minute drive from the center of Pittsburgh. In a lot of places in the US people consider that a normal commute. I don't quite understand why the Center for Asia Pacific Aviation has this... don't even know who they are really... but they have a post today with some great stats on the history of business at the airport here. Worth a read. Among other things I note... we used to have air service to Youngstown? Really? Wouldn't you be in glide path before you even took off? Shades of Spine Line Skybus. County is floating a people mover system for Oakland and environs. Hmm. Who suggested that? People mover being one legacy of Pittsburgh's own Skybus. If it connects Oakland and Downtown does it count as a successor to the Spine Line? Skybus+Spine line... perfect together? A commenter here suggested something intriguing. I pointed out how the proposed changes in the state sales tax could potentially bring a windfall for RAD revenues here in the county. Could that money be leveraged into enough to fund something like this? and not in order of importance, and I am sure this is being noted elsewhere.. but the NYT has ever more coverage of the Bresma orphans today. I also note this post out in the ether on other doings in Haiti fwiw. What any of it means I have no idea. The NYT does talk a bit about the Governor and entourage arriving in Haiti. My whole view of twitter changed watching all this transpire, in particular when out of the blue I saw Fox news producer Adam Housley 'tweeting' about the unexpect arrival of the Guv on the tarmac at the Port au Prince airport. First off. Tube City Online has some deconstruction of new Port Authority bus routing. He focuses on the near Mon Valley, but some funny observations in there. Where's McKeesport? But more intentional humor is the obligatory and omni-municpality pothole cartoon Jason has as well. Not a joke unfortunately. See the update in the PG's Roundabout new blog about one expensive pothole. Ouch. Potholes always bring to mind one of the more concrete results of the whole Act 47 process. Consider that the original Act 47 Plan required the City to sell it’s asphalt plant. (page 151, page 163 per the pdf numbering). Gotta save money by all means available no matter how little sense it makes. Check out the link above to see the costs for just one car in just one collision with just one pothole in the city. And I bet we have a few more freeze/thaw cycles left this season. I wish there was a way to benchmark expenditures on suspension work per capita here vs. other cities. Of course the new Act 47 (page 210, page 219 per the pdf numbering) plan approved last year says the city should “fully analyze the costs and benefits associated with a new asphalt plant”. Anyone want to check in on what the results of that analysis were? Of course, the Act 47 plan had no money allocated for that study mandated by the plan. If we want our asphalt plant back, it's amazing what you can buy on ebay. Think they would take Paypal for that? Of course we might only be able to afford this one. 63cm could be awfully close to 25 inchs. What was our snow total, or Philadelphia's, for that matter? The line about 15 thousand pieces of snow removal equipment is almost funny. I wish I could remember all the jokes in a lecture I once had on old Soviet humor. I know it may seem boring, but the news article about a payment from Siemens to the state to compensate for not building a promised fuel cell plant here is pretty important. It's a good write-up, but still does not really give credit to how big a deal this was in our pre-G20 mentality when we were desperate for big 'wins' like this. This is the site now used by US Steel for some R&D operations at the far end of the Waterfront development. You have probably driven by it. I had thought it was a great symbol that it was right across the river from the Carrie Furnace site. Alas. The site selection free for all over the Siemen's plant was big news at the time. The competition for the site was huge. Ross Perot in Texas put really big $$ on the table to attract the plant to Texas. There are a lot of lessons to be learned from the decision of Siemens to keep the plant here despite what was clearly a far superior set of financial incentives to locate the plant in Texas. At the end of the day just trying to 'buy' the jobs didn't work for Texas. and even if it did, what would it have bought them given that it didnt materialize? I suspect that Ross would have ponied up the money, but would have driven a tight bargain in the contracting. Something that might have resulted in Siemens owing back a much bigger number than they are being hit with here. This was also a big story for regional cooperation. The decision to locate in Pittsburgh was one thing, but where in the region was another. There was a plan to locate this all out in Armstrong County, but at the end of the day they chose the Allegheny County Waterfront site. There was a lot of gnashing about that locally some may recall. I think it was so bad it actually spurred the local powers that be to actually work toghether better in the future to avoid the same level of consternaton again. But it gets to all this talk of regionalism and our ever increasing number of regional projects. Why did they choose to build locally? That right there is a big question that ought to be studied in the economic development literature. The short answer is that it was a workforce decision. They had a core of talent focused on this fuel cell technology and there must have been a decision that that workforce would not relocated to places in Texas or Florida that were actively competing for the new plant to be built. It might be more of an extreme case given what was likely a very senior workforce in place here. The Siemens unit locally was another one of the remnants of big Westinghouse that was spun off in the CBS implosion. So it really is another datapoint in the whole 6 degrees of Westinghouse dynamic in the local tech economy. Why did they not build in the end? They said market conditions changed which isn't really the answer. Remember this was back 2002ish and in subsequent years energy costs went bezerk. The basic reason was the technology could not be made cheap enough to produce commercially. They had thought that at scale they could produce the medium sized fuel cell plants cheaply enough to sell commercially. That didn't work out it turned out. These were mostly going to be Natural gas powered stationary plants that could really have formed the backbone of a more distributed electricity production grid in the nation. There was a pure market component as well. Remember there was once a big need for that type of generation that could be used as spot production in peak energy cost periods. Remember the Midwest Electricity cost spike that was pretty calamious, or the California energy debacle and things like the energy cascade failure emanating from Ohio a few years after that. Those were clearly on a lot of people's mind at one point. Has not been any high profile failures like that in some time, but let's hope it has not lead to complacency. When they happen, these things are bad for everyone. The thing is that while Natural gas prices had their own bubble experience a few years ago, the price for natural gas has been plummeting. You have to wonder if this idea will come back. Whether it's here or not who knows. But this was a big piece of my thinking back when I wrote Energy Burgh some years ago. Spotted via BoingBoing.... and it's not exactly The Terminal, but if you ever asked what you would do if trapped out at the Pittsburgh Airport all night. Here is someone's answer during Snomageddon. My question is, would you really need to wait until after hours to film that? Some of those concourses are pretty empty all day long. I once asked for ideas to give the airport on what to do with the underutilized space. I say fill one of the gates up with buoyancy neutral helium balloons for a big interactive art display. Call it the Warhol Museum West or something. Seriously, there ought to be some creative uses for some of that space out there. So a committee working on advising the city on the sale or lease of the city's parking assets met for the last time today. Who knew? First question, did they address whether the assets should be sold or leased. Some very senior economists have said they should be sold outright and not leased. Was it even on the agenda? The headline coming out of the meeting is that the panel recommended that the parking rates of the newly quasi-privaitzed parking lots be allowed to move to market rates. The economics are not that simple actually. First off, parking Downtown is amazingly full every day. Since the PPA rates are relatively low to the market, rates will clearly go up no matter. The question is by how much? I didn't realize they were talking about limiting the ability to build more parking garages. Coupled with the recommendation of letting prices move to market rates it raises an interesting economic question. Given how little space there is Downtown for parking or for building new lots is there a market price that is not partially a monopoly price? There is this little requirement of free entry for there to exist a market price for those who remember econ 101. In fact, given how big a supplier the PPA is in the Downtown parking market... it's not a question of whether the rates at PPA garages will go up to the current market price.. but how much farther they could inflate? The PPA rates are not only relatively low, but are likely keeping all the other rates Downtown lower than they would be otherwise. If left completely unregulated, which seems to be the recommendation of this panel, you really have to wonder how high rates could go beyond what the private lots currently charge. But why are we doing all this? It's all about the state of the pension system of course. So with everything coming to a head, the potential parking asset sale/lease, the impending state requirement to get the city's pension system over 50% funded in order to get avert a state takeover and the actuarial report for the pension system soon to be made quasi public.... what is the most important meeting coming up?? The most important meeting you probably will hear nothing about beforehand, and little about after the fact other than for the most intrepid of reporters is the quarterly meeting of the Pittsburgh Municipal Pension System. Should be this coming Thursday February 25th unless someone has better info?? It's been a rough quarter for the stock market among other things. They ought to have a lot of things to talk about. Playing around with the PBT's searchable database of stimulus funded projects in the region is kind of fascinating. Aren't there both city and state stimulus tracking projects? I really can't recall nor find much on either, but if they exist do they have similar info? If you didn't catch it, over in the City Paper I put up some maps of how the elections for the Allegheny County Democratic committee went 4 years ago in city districts. The maps are online via the City Paper here, but you can still get the dead tree version until the next edition comes out on Wednesday. Go check it out if you have any thought at all of running for county committeeperson. The maps were just for the city districts and if I get a chance I will do something similar fo rthe rest of the county. The thing is that as uncontested the city races were, many of the county races frew less interest. So if you wanted an easy path to becoming a micro-player in the policial scene and you live in one of the suburbs you may a pretty simple path depending on where you live. If you really do think about running, you probably need to figure out what voting district you live in. The county's polling place locator is a good place to start with that. To figure out the scope of your district though I have KML files online which overlay in Google maps to help that. Try these links for either the City of Pittsburgh proper or the remainder of the county. You can zoom in interactively on these. These are from years ago and I'm sure someone has something more sophisticated at this point to do the same, but I have not looked very hard to find it. Similar maps for some of the nearby counties are on my map page. Something to think about. There are over 400 individual voting districts in the city, but over 1,200 in the county. Does that really make sense? County has made several attempts to cconsolidate the sheer number of districts over the decade, but have typically been thwarted in implementing any meaningful change. You really have to wonder how long they can keep supporting so many districts, each of which needs pairs of election judges and a number of volunteers in addition. My personal observation is that the average poll worker is well up in age and older than the average county voter which is pretty old to begin with. At some point in the future you have to wonder if they can continue to man so many machines at the same time. It goes beyond sheer cost-efficiency. Except for the US Senate, there are strong legal requirements that force district size to represent all cizents equally. One person, one vote. The disproportionality of voting in the senate is a debate unto itself, but from congress to almost any local legislative race comparative districts must be of equal size to the maximum degree possible. It sure does not work for any election by voting district. Last fall in the general election McKeesport Ward 1 had one vote cast. Moon Dist 2 had 591. and that was the general election. and some of the worst potholes you have ever seen. We are not listed at all in Forbes latests rank-o-rama of the most miserable cities... but Cleveland tops the list along with more than a few of our nearby Ohio neighbors. Hard to believe Detroit has even a speck of Schadenfreude over being ranked a smidge better and Stockton is arguing with the math. For either I'm not sure I would waste the PR arguing that things were merely dismal and not abysmal. But hey, maybe we won't be ranked the worst place for singles again? Spotted behind the PG+ paywall.... but free here. More Ohio observations. Cleveland's airport may not be doing great overall, but it has been ranked as one of the most improving airports in the nation. One of the things that hurt Cleveland in the ranking of miserable places was a public corruption metric defined by the Forbes folks. Not much note around here of what has been an ongoing and extensive Federal probe of local government up there. News today on some mysterious printing bills. I thought I would check in on Ed Morrison's crowdsourcing project to track the corruption issues up there: MapTheMess, but it looks like it has not been updated in some time. Since I depress myself with all that, let's add something a little less dreary. In Akron they have a new slant on Town/Gown relations. Read about the efforts there where the Univ of Akron is actually trying to support the creation of a new neighborhood altogether. Never forget. Today is Iwo Jima Day. I wonder if there are any vets who were at Iwo Jima still around locally. Can't be more than a handful at most. The single largest number of ships employed in the landings on Iwo Jima were Landing Ship Tanks (LSTs). I think it's a safe bet to assume many of them were built right here in Pittsburgh. addendum: and just refreshing myself on some of the history there... anyone know the link to burghosphere history? No joke. I have to say I don't think this really will add up to much, but we should encourage Toland to do more of his diaspora reports. Read about who are the folks who will be streaming into Pittsburgh pretty soon. Talk of MBB entering race for PA-4 held by Altmire. You can look at maps here of how the first Altmire-Hart race went, and what changed in the reprise in 2008. Which again brings up again... Still no US Attorney here? Is it because of Sen. Shelby's holdup of everything except for paying the water bill in the Senate, or something else? I guess I should know better than to assume. Maybe he is holding up the water bill as well? Are the toilents in Dirksen working? City pensions in a bit of news. You can join me in obsessing on all the city pension data you can absorb on my iPension page. Does anyone other than me ever ask why you can't find almost any of that data on the city of Pittsburgh web page? That came to mind because I was looking at the web page for the Detroit municipal pension system. They actually even post the minutes of their meetings. Their minutes?! That paragon of public transprency, Detroit, is eons ahead of us when it comes to transparency and e-Government. But we have iBurgh, so I guess we can call it even. They even post current actual financial data of their pension system. Go try and find anything comparable here. No matter really. All pension debates here are going to change in just about a month from now when the city has to file updated actuarial reports. Westinghouse watch. Surprised not bigger notice here of the news of federal guarantees for the first new nuclear reactors in the US in some time. The maker of those reactors: Westinghouse. Wettick watch. Anyone notice the assessment mail they should have received in the mail. Mine came right in midst of the blizzards. Probably gave the county an easy excuse to ask the Judge for a delay of some sort. Kind of a side note on property value. It would be beyond me to quantify or even guess at.... but I wonder how much damage in total all this ice is causing. Pittsburgh has what by many measures is the oldest, most disinvested, housing stock in the nation. Couple that with the nature of this pepetual snow/ice and you must have a big number when it comes to total value of the damage. But don't call me looking for that number, try the insurance companies. Thinking of which, maybe Nationwide will distribute an iGutter app or something like that. Great pic in the PG on that, but you can take your own.. Just walk a few blocks in any neighborhood. More Chapter 9 Bankruptcy talk in the Wall Street Journal Today: Muni Threat: Cities Weigh Chapter 9. A very brief mention of Pittsburgh in passing in there. For those landing here for the first time, you might want to see my comparision of the financial situation in Vallejo, now in federal bankruptcy proceedings, and Pittsburgh in an old post here. But it's pretty clear the bond insurers are spooked at this point just by all this talk of more municipal bankruptcies. There are topics I really shudder to touch. Too important, too complicated, or just things that need to be dealt with by higher powers. It really is true that we don't know all the circumstances surrounding what happened in Hazelwood, but in the end it is clearly a low point for everyone involved. It is just hard for me to get out of my head how different the response was to this call and what may have been one of the finest hours for Pittsburgh's public safety departments. Nearly 32 years ago paramedics and firefighters got to the very top of a collapsing Brady Street Bridge to amputate the leg and save the life of the ironworker trapped up there. Hard to imagine any of the folks involved in that rescue being deterred from getting to someone in need by a few blocks of snow. Wait! That does not work on voting machines does it? I always suspected that if you actually voted for the Constitution Party candidate it activates some secret trap door in the machine (now computer) that leads to nefarious things. Seriously though... who writes and audits the software running the slots machines here and everywhere for that matter? I'm sure that was all written into the law that enabled gaming in Pennsylvania. or do I mean Harrisburg Bust? Bond Buyer has the latest on what could be big news in Pennsylvania, let alone public fiance markets and in particular any future bonds the city here would ever want to put out… boring talk about the ability of the Harrisburg Authority to make bond payments coming due very soon. As mentioned here previously, it appears that the City of Harrisburg is on the hook for this indirectly… something which has sparked talk from the city officials of a potential Harrisburg bankruptcy in the not too distant future. Always wondered what a potential bankruptcy for Pittsburgh would mean.. and it is something I have talked about publicly. People have tried to tell me it would not be allowed in Pennsylvania, but that is an almost meaningless argument. If now state capital is publicly talking about the potential of going bankrupt!!!! I think the repercussions would be even greater. Would the legislative denizens of Harrisburg allow their municipal colleagues down the street to reach that point?? So I don't really think it will happen.... but the open talk of it all is a new paradigm in itself. It has the bond markets and the bond insurers in particular pretty spooked I have to believe. Ha. PG picks up the Parking Chair theme with the intro of comments from here in Parking Chair Zen. Speaking of The Chair*.... local style guides should require capitalization! The living reference that is Wikipedia is has continued to expand the (no longer just Pittsburgh) Parking Chair page. Fascinating to watch. It now even needs a table of contents. Did you know the the Pittsburgh Left has it's own page as well? Does it mean anything that the only Wiki entry for "Pittsburgh Left" refers only to the traffic manuever? i.e. Wikipedia has no disambiguation for any political use of that term? On that though... support the dead trees. You might find an interesting map in the CP today that Potter (or his bosses?) will not put online until tomorrow I imagine. Some related Pgh-media-tech-geek history. Anyone notice the CP is now using the old doman for In Pittsburgh (http://www.inpgh.com/)_which it bought some years ago. The commute from Samoa (.ws) must have been getting painful in that they were using (http://www.pittsburghcitypaper.ws/). I've been meaning to ask. Who owns pittsburghcitypaper.com? Oh yeah..... gotta keep up with the times: #parkingchair. * no Bram, not that chair. Lots of good stuff updated in Toland's Casino Journal. See the part and links about the talk of Cleveland getting a tent casino up and running sooner rather than later. 2 hours up the road. and a decent bounce back for the casino here despite the weather. I do have to say I find the moderate bounce right after the assessment value was pegged to be curious. So what would you say is the biggest thing going on in public finance that will impact your wallet next year? Assessments? Maybe, but there will be no change to your property tax bill coming soon no matter. Dave posted this last week almost and I kind of missed it. It seems Dave, or as he explains Mrs. Dave, caught something that I am upset didn't occur to me when I saw the original news. Some may have noticed the big news in Harrisburg last week. The governor's proposed budget wants to lower the state sales tax rate from it's current 6% to 4% yet somehow increase the revenues the sales tax will generate. Magic? No, the idea is that the things the sales tax would cover would be increased. Its something like 70 or so exceptions of things that do not get hit by the sales tax. So the great increase in coverage will more than make up for the lower rate. The base for the sales tax must be going up by at least 50% for the math to work out. Dave's back of the envelope suggests the proposal could increase what is hit by the sales tax by up by 75%. But then there is Allegheny County, which also gets revenue from a 1% sales tax and redistributes it via the Regional Asset District (RAD). So think about that. If the 1% county tax stays the same and the base of what is taxed goes up by 50%-75% then how much will the RAD tax bring in locally? For 2010, the RAD budget was a hair less than $80 million. With a big expansion of what the sales tax covers, the RAD be looking at a $40-60 mil/year windfall in future years? Could make a lot of local issues look a lot different. Library funding? Transit funding? The share of that which the city will get by statute could go a long way toward closing that 15 mil shortfall that so traumatized us last month. $40-60mil is kind of small compared to the entire county budget, but when you really parse out the truly discretionary part of the county budget, $60 million would be a huge chunk of new revenue to allocate. Could almost transform the role of the county in local government. So a big deal potentially and it might be worth talking about sooner rather than later even if there is only a chance it will happen. There is a story in Navy history of the meteorologist buried deep below decks on an aircraft carrier who called up to the admiral on the bridge with the weather report. Clear and sunny for the next several days he reported when in reality the ship was barreling through a massive storm. Anyway, I swear the evening news report I was watching said the total snow expectation for the day and evening was 1-3" by morning. Having just walked home through near blizard conditions at a couple points, that story came to mind. I think I had an inch on my head. It's unavoidable in politics that the poor guy isn't buried yet and the talk is mostly about who might replace the late Jack Murtha in congress. Here is the thing about Pennsylvania's 12th Congressional District. 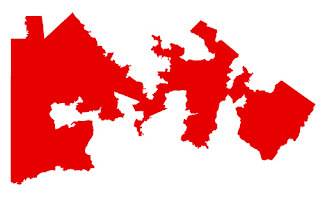 To understand it's makeup, let alone it's map, you have to go back and look at the redistricting that resulted in Pennsylvania's 18th Congressional District. I have discussed the history behind the creation of PA-18 in the past. PA-12 is prety much what was left over once PA-18 was carved out deliberately. 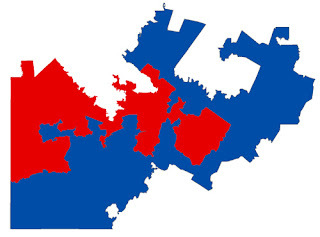 18 might be one of the most analytically drawn districts in history. What was left over in Southwestern Pennsylvania that also included Johnstown, the home of longtime incumbent Murtha, was strung together to form PA-12. The extreme division that results between PA12 and PA18 comes out in a lot of ways. Here is a summary of how the two districts differ by just a few metrics. Those stats are pretty amazing. 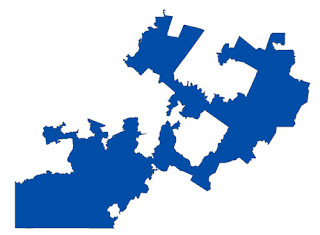 You really could not have created two more different districts if you tried. That they are not only side-by-side, but literally overlapping is a tribute to the mapmakers who came up with the boundaries of the two districts. Let's just say they were not drawn randomly. OK, clearly we all have cabin fever at this point... that is the only reason I figure anyone found this. Just a bizarre observation from Joe on what Microsoft thinks PNC park looks like. I almost didn't believe it, but I had to install Bing maps to see it myself. It's like they mashed PNC Park, Three Rivers, maybe even some elements of Heinz field all into one structure. At different resolutions it actually appears more correctly. Curious. first off: Why does this picture look a lot worse than the local news has me expecting? That and I am sure we are now getting a lot less lake effect snow now that Lake Erie has frozen over. and speaking of Pennsylvania snow, Philly seems to have done ok with dealing with the storms. Reading more on Philly and snow I came across this article. Who knew Brian O'Neill was a Philadelphia City Councilman? He must travel across the state an awful lot?? PG posts a graphic from the Calculated Risk Blog comparing past US recessions to this one. I have not updated it, but if you want to see the Pittsburgh perspective in the same type of graph, it was in this post last year. Last week I mentioned the problem that snow days meant minimal, or no, Meals on Wheels for many seniors for an extended period last week... I had not thought as much about the corollary impacting many kids who rely on food programs at their schools. See the AP writeup on that. Trib has a story an the economic cost of the snow storm(s) here. It comes in higher than the number I had here last week but the methodology is much the same. I was figuring a city number, and looks like they were quoting a similar back of the envelope number from Professor Lave for the entire region. The only difference between the two is that I'd quibble with the implicit assumption that the snow day had everything shut down at any point which I don't think is true. But whichever numbers you look at, the 'cost' of being shut down is orders of magnitude higher than the $$ spent on dealing with the snow directly. In fact, if you take Professor Lave's numbers, the cost-benefit analysis would be an even stronger argument for doubling public expenditures for snow removal to minimize disruptions from this type of situation even if it only happened once a year. PG also looks at the impact of government fragmentation on how we dealt with the snow. Just worth looking again at the graphic I had in the PG last month showing just how fragmented local government is... Talking about it, or seeing a few numbers just does not really show the situation. PG also has an oped from Elsie Hillman and and David Roderick on their past report looking at the state of city's finances. Over the years it has been a cottage industry to study the city's finances and a slew of past reports I try to keep compiled among the things I have online here fyi. And the Pittsburgh Parking Chair gets a few more mentions out there including this in the Delware News Journal. Up in Cleveland a story worth a read: Suburbs losing jobs faster than city of Cleveland, new data show. Is that the situation here? and finally... for now. Inky writes of the dire state of Atlantic City casinos. I'll add this in here since it kind of got lost in the snow-obsession last week. Given that the Rivers Casino had to shut down entirely that Saturday and must have been hit by the bad weather the Friday before that, their revenues that week were nowhere near as bad as I expected. Bad, mind you, but I expected a week worse than G20 for them and they came in a bit higher. Really really bad numbers out at the Meadows casino though. For both I do now believe they must be burning cash pretty quickly at anything near recent revenues. finally finally. After reading the last line: Ouch. There is this Yogi Berra quality to what makes up the essence of Pittsburgh. With Yogi, the words may not be the most articulate, but nobody doubts the inimitable philosophy that comes through. Similarly, who knew that the typically haggard parking chair was really an expression of our inner Locke? The neo-chair is transforming with the times. My brief foray into Wikipedia world, the creation of a Pittsburgh Parking Chair page, now has been a curious story unto itself. Expanded voluminously by many it has now been subsumed into an even newer page titled: “Parking Space Reservation in Snowstorms”. L'audace!! I kind of get the logic, but it’s missing the point. It’s as if someone out there took over the entry for the Terrible Towel with something like “Absorbent Linen used for cheering during sporting events”. That just wouldn’t do. Wikipedia might even have suffered the penance of the Tennessee Titans for punishment if that had actually happened. I wish I could tell how long the parking chair has had some sort of cultural identity unto itself. The parking chair isn't new at all, but it's almost Warhol-like re-emergence here is. I bet that in the 40’s people just did it and never considered it noteworthy in any way; it just was. One of the older references I can find was a 1994 Peter Leo column where he suggests the parking chair might only then have become passé. **** Yet now almost two decades later it has it’s own Twitter #hashtag. What is old is new again? Or maybe the chair reflects one of those timeless things that make Pittsburgh Pittsburgh. * or other household ephemera I know full well. ** I'm calling you out O! Snow, the Parking Chair and Henry George. Discuss. *** The city has said the snow cost comes to a cool $million thus far. We love to add up the benefit of earned media from the G20. Surely we've generated a million in media buzz at this point. Maybe this was all staged for the attention? I guess that would make John V. the equivalent of James Kelloway. **** Peter was also one of the bigger Parking Chair defenders it seems. See Chair Raid Undermines Our Society also from 1994 in the PG. If a city goes bankrupt in a snowstorm, does anyone notice? Harrisburg, Pa., could be in the ballpark. A top city official said this week that the capital of the sixth-most-populous state may file for protection from its creditors as soon as March 1. I missed that entirely, though it was in the WSJ a few days ago. More in BusinessWeek yesterday. Their bond rating has been dropped almost as far as the casino's here.. Some folks have argued with me in the past that Pittsburgh could never file for bankruptcy because 'Harrisburg' wouldn't allow it... So what does it mean if Harrisburg proper is clearly talking about a straight up Chapter 9 Federal bankruptcy. The thing that is really fascinating is why Harrisburg is in such a pickel. Bad planning on their part? Rampant spending or dropping tax revenues. Maybe mounting pension liabilties or too many perks for their local pols? None of the above. They are merely guarantors of part of a loan made by their housing authority for a trash incinerator of all things. There has to be a joke in there somewhere about the need to get rid of all the paper being generated by state government these days... should bring steady biz to a trash incinerator? But the fact that Harrisburg, the municipality, could fail because of spending by a local public authority really ought to get those folks in Harrisburg, the euphemism, thinking about the mess that is governance in Pennsylvania. What potential debt is the city of Pittsburgh on the hook for via its public authorities? Someone might want to add up what that comes to these days.... and then tell those folks at Moodys maybe. I honestly can't believe the folks running the state would let the state capital do any such thing. Someone will call in Act 47 on steroids or something. but you never can tell what will happen in Harrisburg? Sheer dithering is often the default path out there; yet those bond payments come due no matter. How much does a 'snow day' cost? Daily Finance tackles the unanswerable question of how much a 'snow day' costs the economy? So here is my back of the enevelope stab of our version of that for the city of Pittsburgh. This is not the cost of dealing with the snow directly, but the cost of having so many things closed. The entire regional economy is roughly a $120 billion dollar economy annually. You hear about GDP for the nation, that is the Pittsburgh version depending on what definition you use for the region.. blah blah. Just trust me for a number to start with. How much of that is economic activity in the city proper? The city has just over an eighth of the region’s population, but more than a quarter of all jobs are located in the city. If you look at payroll, jobs located within the city proper account for over a third of all payroll earned in the city. That's an important factoid in itself... but for the sake of argument let’s call the city economy $40 billion a year. We can quibble over a billion here or there. How much is that per day? If you divided by 365 you would get roughly $120 million/day. But of course a weekday is worth more than a weekend day. If you divided by just the number of weekdays you get a number of $160 million/day. So somewhere between the two is the total economic value added generated in the city each day. Now it gets hard. Even on Monday it’s not like everything in the city shut down. May seem like that was the case, but it probably wasn’t close. Hospitals and health care: all mostly operating. Lots of stores were still open and doing booming biz. Some things, say auto towing, were having a banner day in a positive sense. Lots of stuff Downtown stayed open, or had workers toiling away from home or elsewhere which would not be a total loss. Anyway, as a pure guess let's say half of of the output generated within the city was lost each day.. at most. The Daily Finance article actually quotes a snow day as resulting in 20% of workers not showing upfor work. At half the lost GDP comes in between $60 to $80 million a day. If we say city was virtually shut down this way for 3 days you get a mythical number pushing $250 million. Not that simple of course. A big question is how much of that lost output could be made up later on. So that number probably errs on the high side, but it's a number. How big a number? Net of debt costs, that $250 million is on par with the entire operating budget for the city of Pittsburgh for the entire year. Only a small small fraction of that budget is dedicated to either personnel or equipment dedicated to snow removal directly or indirectly. Would be an argument for being a little less stingy with the snow cleaning budget. Of course whatever that would cost would be seen as an immense extravagance that the city budget could never be able to afford these days. Bond Buyer covers both the Governor's proposed $29 Billion Pennsylvania Budget, but also that UPMC will refinance their mega ($1.1 Billion) bond deal next week via Allegheny County. Public finance wonks may recall reading how this all may have been worked throught he state because of the lawsuit briefly in play over the closing of Braddock Hospital. But that pending litigation was tossed, and it looks like they are closing the deal with the county. I also have not been paying attention, they had a story last week on progress in Harrisburg (is that an oxymoron) to ban the use of swaps in municipal finance in the Commonwealth. Remember those? Just think, the PWSA has not been in the news for what.. 3 days? Excellent... Mike's musings on Pittsblog land the Pittsburgh Parking Chair on the NYTimes Freakonomics Blog. No mention at all of the increasingly more substantive Pittsburgh Parking Chair page on Wikipedia. They can't possibly delete the page now can they? at least not based on a lack of notoriety. update: ditto for the Chicago Tribune. The blizzard in Chicago didn't stop an earthquake up there today. Think we are immune? We have had some real earthquakes nearby pretty recently. In fact that1998 Pymatuning earthquake was the largest recorded earthquake in Pennsylvania history; also one of the closest earthquakes. Am I worried about earthquake risk in Pennsylvania? Not directly. But even if an earthquake just on the scale of what happened in Pymatuning happened here; how much of our creaking water infrastructure would survive? Some of our water mains break if you stomp on the ground too hard. Wouldn't be pretty if we got a jolt. and I hate to say, for homeowners it wouldn't be covered by insurance. Just something cheerful to think about. Happy Snow Day! Anyone tracking the record for the longest number of consecutive snow days in Pittsburgh Public Schools? update: I wouldn't say any of that was necessarily tongue in cheek, the Pymatuning earthquake was quite real. But I really am not all that worried about earthquakes here in town. At least in the continuum of risk we have to deal with I didn't think this was high enough to really devote too many neurons worrying about. Yet you would be surprised how many blind google hits are coming to this page for searches which are a variant of "earthquake risk Pittsburgh". Is this something people really ponder. Maybe they mean Pittsburg, California? I may have to ask Louise Comfort about this. We've seen the stories which have made news thus far, but I really am beginning to worry if we have taken account of our elderly. It's not so much the folks living together in formal or informal group homes, but there are an awful amount of folks who live on their own out there. Some may not have relatives, or at least any relatives nearby. We really do study Pittsburgh as an extreme case of having an inordinate number of what we call NORC's, or Naturally Occuring Retirement Communities. So folks living in our neighborhoods, yet not living in even semi-institutionalized settings where someone is surely going to keep tabs on you. I think we actually do a good job taking care of our elderly in the region under most normal circumstances, but things are not very normal of late. I learned this week that a lot of the Meals on Wheels services in the city do not operate based on when the school district is not open. Seems a rational criteria; if things are so bad that we shut the schools then it probably is not safe enough to send out the mostly volunteer drivers who deliver the food. Yet things like Meals on Wheels provide a real service beyond the food they deliver. For many it is their main contact with the rest of the world. Given the closure of the schools for 3 days and the weekend before that, many have not had their MoW delivered in 5 days. Clearly there are lots of great stories of folks helping out their neighbors out there. I bet most everyone is doing all they can for those they know are in need. It's the ones we don't know about that is getting troubling to think about. Are we all still here? Snow has not yet extinguished all activity across the city and region? So I just want to know a couple things. Who put money into this meter? Could there possibly be an available slot next to it? Did someone not get the memo that it's free parking all week now that the Pittsburgh parking authority has laid off its meter enforcers for the duration. Methinks the photographer was framing the photo. I think it would have been better with the 'expired' in there. There are a slew of honest to goodness serious questions in all of this. Parking meter leases anyone? Folks realize the Pittsburgh Parking Authority has taken over the parking meter ticketing operations in the city. I wonder how all this will work once the meters have been privatized. Think the yet to be named meter operator will let off their enforcers under any circumstance? 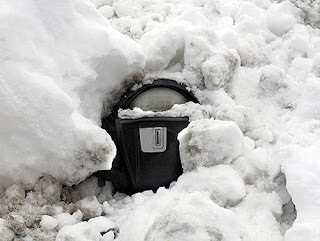 If the city plows snow into a meter parking spot, will they send the city a bill for impinging on their income generating asset? For our legal beagle friends: would that constitute a taking? Actually I have been meaning to check what happens in Chicago or wherever meters have been privatized. If you get a ticket and want to dispute it, do you still get to appeal a ticket to a judge of some form or another. I sense a principal-agent problem somewhere in all of that. I just kind of wonder if all of these issues are somehow being priced into whatever bids someone will be making if all this goes through. Waiting for Godot: Accuweather Radar. (update: the Accuweather version has a big 'ice' blob that is getting awfully close to us. The Weather Channel version has an ever increasing swath of 12+" snowfall that is getting closer to including now including a chunk of us. It's sure looks like a pincer movement. 'NUTS!' we say. I was just thinking... if this storm slows down a bit we're really toast. and the Pittsburgh Parking Chair page on Wikipedia is filling out and has yet to be deleted by the wiki gnomes. We need a photo! Someone must have a classic shot of a parking chair in action. I'd add in a picture of a Pittsburgh Parking Coffee Pot?? but I don't think I could explain it concisely. It would probably lead the Wiki editors to think the whole article was a joke. and I was just curious if the news archives could give me a number for how many city plows were operating in 1993, but couldn't find anything... But isn't this article from back then interesting. Since we are going to be talking about the state of the snow in the city for some time, especially since a lot more snow is coming.... Beyond the criticisms most everyone is talking about, it probably is fair to note that you can't really expect the city's ability to respond to snow to be the same now as it has been in the past. The successive downsizing of the city's workforce can't not have an impact on it's ability to surge work in circumstances like this. Uber-efficiency has it's costs and probably should be part of the discussion as we debate the city's budget. I have not updated this with the latest data which probably shows even further decline. Below is what I have showing the city's non-uniformed workforce (excluding police and fire that is, EMS and others are in there) looks like. Bottom line, between 1995 and 2007 the available workers are down a non-trivial 30%. I suspect the decline public works and sanitation is even larger. We can debate all sorts of things, but the miles of roads has not changed a mile over that period. Not just the workers, but has the city had any money to purchase anywhere near the capital assets (trucks, etc) it needs to do the job we expect. Let's consider something.. Imagine if all that snow didn't arrive right at the very end of the work week, but on a Monday morning. What are the full costs of the full week the city would have been shut down? Philadelphia Inquirer today looks at the casino market out here: Suburban competition hurts Pittsburgh's Rivers Casino. I suppose one has to retort a bit that the Philly folks can't get their casino operating at all, alas. I was actually going to try and go to the casino for the first time on Saturday... of course it had to close. It will be due to exogenous factors I know, but the casino earns most of its money Fri and Sat I imagine.. Saturday it was shut down hard and Friday evening must have been pretty quiet. So I expect their revenues this week will be pretty minimal, probably the worst week since opening. Again, it won't be a reflection of their marketing or anything, but it will nonetheless be a weeks worth of revenue and their fixed costs don't go away. Weather happens. Bad for them of course, and it will end at least a 2nd week of stable revenues. They have a complementary article as well: Pa. likely to steal Wheeling players. Of course, to be consistent that argument can only go so far and will have a negative corollary when the Ohio casinos open not too long from now. With all that I began to wonder whether things would be open for school/work/etc on Monday.... but then I saw that the paper was delivered. I suspect that in these conditions you almost don't need a formal parking chair at all. If you found an obviously shoveled parking spot that just happened to be in front of someone's house, you would be on dubious territory to try and use it yourself. A couple months ago I tried to instigate someone to create a formal Pittsburgh Parking Chair article on Wikipedia... but I am much less successful than Colbert at this type of thing and I don't think anyone took me up on it. So I have figured out the wikipedia code and created a Pittsburgh Parking Chair page on Wikipedia. It is pretty sparse. I fully expect the parking chair experts in town... Ms. Mon!...or other Wiki editing gurus out there to supplement what I have there. Probably good time to point out again the official Pittsburgh Parking Chair Map. Over the pond there has been a big scandal in the British parliment over the expenses paid to members of Parliment. The Guardian's data blog recaps some of it, and has a visualization of the whole thing. One of life's little ironies is that the independent journalist who really pushed the whole issue over there is Heather Brooke who was actually born in Pennsylvania. The bios never specify where in Pennsylvania, but maybe it was Harrisburg? First off. Might have been a joke before, but it really is time to fire Phil. I am sure there are thousands of photos like this out there... but it really is a wet heavy snow. What I am noticing anecdotally is that the electric lines are holding up a lot better than the cable and phone lines which almost all look to be under duress. If you are crazy enough to be out there driving, realize that even if your original Hummer with chains can make it down the road, you still may be driving right into some drooping cable. But it is pretty. Where are the folks who were squawking about how our snow stories were all more Yinzer lore than reality. Am I missing something? The winter olympics are imminent and nobody is talking about the youngest member of the US Luge Team: Pittsburgher Robby Huerbin. Where is Colbert when you need him? more from the sports desk. The NYT adds its own perspective on the passing of the Steelers' Bill Dudley. and Business Week has a look back at some Steelers history even focusing on the sports book during XIII. Detroit press pondering Piston's move to the Burgh (NS Jan 24): Pittsburgh mentioned in Pistons' relocation speculation. Let's call this a personal sidebar. My picture once graced the pages of Cosmo. When you have stopped laughing (or crying I suppose)...... I am not joking. To think some people think I'm all about the numbers. Points for anyone who can find the actual photo, although I am pretty sure it isn't online anywhere. Mr. Google does not seem to help much either. OK.. back to something more substantive. You would think Governing was writing just for us. That or we are just a poster child for every policy issue out there. Two recent posts from their 13th Floor Blog are really quite on point for us these days. According to Dan Borut, executive director of the National League of Cities, one option municipalities likely won't be exploring is the idea of selling off major public assets to be managed by private companies. Large-scale sell-offs ...... are a thing of the past, he said. "These deals have had a number of problems," he said. .....don't expect any full-out city-county mergers coming anytime soon (although that is something Wharton is pursuing for Memphis and Shelby County). Rather, look for more and more cooperation between cities and counties in information technology and procurement, as well as in providing services such as health care, education and public safety. "I think it's highly unlikely there will be more consolidations" of governments into a metropolitan city-county unit, said Don Borut, executive director of the National League of Cities. "People identify with the city where they live, and that's not going to change." OK.. I have to admit the news filter for "Maglev" caught this piece from the Scranton Times Leader on ever more Maglev lobbying. More interesting though is the plan they are trying to save out east for a Scranton to Hoboken rail line. Growth in a lot of NE Pennsylvania is an extension of economic activity in NY and NJ. Just interesting. But more on Maglev, the project that just won't stay down. Out in Las Vegas they have found a Chinese bank to bankroll a maglev project to the tune of $7 billion. I suppose nobody could interest any Chinese financiers in a small hospital in an old mill town? Big price reduction. Recently refurbished. I have not been paying attention... but there is activity in the chapter 9 bankruptcy proceedings out in Vallejo California. I can't quite tell what it all means, but I once explained why Vallejo matters to us here and here and here. The thing that caught my attention is this little broadside from the bond rating agency Fitch just last week about what the Vallejo precedent could mean across the nation. That right there tells me something is up. Fitch seems to think as I have suggested that Vallejo could be a clear precedent for some other municipal bankruptcies down the road. It all sounds preliminary, but Fitch describes part of it with this line: "At least some classes of bondholders would have to share in losses along with other creditors under the ruling". That right there would mean a lot, but I would love a bankruptcy lawyer's opinion on the other line Fitch throws out there that "Bondholders usually are protected from sharing in losses.". Really? My admittedly non-lawyerly reading of the law on that specific topic would not lead me to any such statement. Well, at least somewhere in Pennnsylvania. BusinessWeek points out that estimates are that the fastest growing municipality in Pennsylvania is Back Mountain, PA.. A suburb of Scranton apparently. Who knew? Random note from the diaspora watch... the new police chief of Miami/Dade County is from Pittsburgh. I really do think the Pittsburgh diaspora runs the world. and one more follow-up on the tuition tax imbroglio... behind their paywall, but the Chronicle of Higher Education profiles the Pittsburgh debate: Towns, Gowns and Taxes: Higher education helped save Pittsburgh, so why are the two sides still fighting? and with the unemployment rate unchanged locally and nationally for December it is now 39 continuous months where the region has recorded a lower unemployment rate than the nation. The story and graphic looks much the same as last month so why update it. But next month will tie the longest recorded period in at least the last half century when you can say that. and I know the news of late is more about the burghosphere's Comet-less future... but I am just noticing that all voy forums seem to be down.. if that is permanent, is collateral damage the demise of the Pittsburgh Media Scoops and Gossip forum? Not that it ever really had many scoops, much media nor even any juicy gossip.